Monday morning we had registration at school. We had quite a few new students to register, and then we had students who came in to meet their teacher and pick up their packets. At first I wasn't sure about why the school system does this, but I think I finally get it. It saves a lot of time the first day with teachers handing out forms that have to be filled out, for one thing. This way, the students should come in this Monday morning, ready to hand the completed forms to their teacher. We got to work in our rooms Monday afternoon. I went to my other school because we had a meeting at 1:00. I was 10 minutes late, and the meeting was over. Oh well! It turns out it was just a brief meeting with the teachers to find out how many students they had come by for registration. Tuesday was the big Special Ed. Inservice. This was the first year that we've done our own inservice, using our own teachers and staff (since they're free). There could've been a better choice of presenters, in my opinion, but y'all have heard all about that already! Wednesday was a great day! The Speech Paths had our own meeting/inservice. We have a really fun group of SLPs, and we always get so many fresh ideas when we get together. By that night I was so worn out that I was in bed at 9:00. It's going to be really rough when I start having to see students! Thursday was "work in your room day" all day long. I managed to hand all of the IEPs out at one of my schools, and get teacher signatures on them. Yes, it took me almost all day long because I had to figure out whose classroom each student is in, walk around to the classroom, and then talk to each teacher about that child (okay, some chit-chatting with the teacher was involved!). A couple of years ago, I volunteered my services to the band director to help the guard instructor with the "clean up" phase of their routines. Due to budget constraints this year, he asked me, along with another mom (who just happened to be in the guard with me for a couple of years in college) if we would help the guard instructor out by being at practices when she wasn't able to be there. My first day to help out was Thursday after school. It took me a few minutes to reacquaint myself with reading charts (along with the guard captain's help), but we got through it. It was hotter than hades, especially since sports come first at the school, so the band gets to practice in the parking lot at the baseball/softball fields. After practice, the band boosters executive committee had a meeting to discuss fundraising and concessions. This is the second year I have been the secretary, and, seriously, I'm considering resigning. I haven't had the best attitude so far this year for work-I'm pretty sure I know what's contributing to it- and this is not helping. It's very important for me to be around positive people: if I can't do that, then I don't need to be around them. There are some things going on with the executive board that I just can't handle right now. I'm more than happy to help with concessions and do what I can with the fundraising, but the thing that's going on is really a downer. We have a new president this year, but that's not the problem. How do you deal with negative people? Any suggestions would be greatly appreciated. Okay, on to Friday! The morning was spent in the school, then we had a meeting with all special education teachers. It was a good day, and I managed to stay positive all day long! Friday night YS, a friend of his, and I went to a AA professional baseball game since my favorite baseball player's (who just happens to be my nephew!) team was in town playing. He's been on the DL this summer, and is working himself back into the rotation, so he's a relief pitcher right now. And, being a relief pitcher, we weren't real sure he was going to play last night. I thought there was a chance when the home team brought in 3 runs in one inning, but the pitcher got himself together. The closer came on during the last 2 innings, and it wasn't my nephew. BOOOOO! I wanted to run down and tell their manager that we wanted to see my nephew, but I didn't think that would go over too well! I have to tell y'all this: I actually made it through the whole game without yelling! MIRACLE! And, we did manage to see my nephew for just a couple of minutes. Let me just say: I have some really handsome nephews! My siblings can make some pretty babies! I did something very, very bad. I knew better than to do it, because I knew what would happen: I would fall in love. And that's exactly what happened. Yes, that's an empty bag, and no, I didn't eat all of them myself. Although I could have. The first few I had I thought maybe it could use more chocolate. Just a little more. By the end of the bag (as evidenced by the crumbs) I thought they were just perfect. That boy loves his mama and knows what his mama loves! Hope everybody had a good week. I'm going to be playing "catchup" on reading blogs for a while! Your MS sure is a keeper. 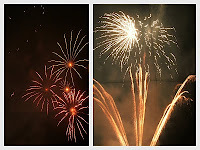 Did you get those fireworks pictures yourself? I canNOT get decent pictures of fireworks to save my life, even with the setting that is supposed to get them on my camera. Hopefully you have a great relaxing weekend this weekend to get you ready for the next week! So many people need that attitude. You did have one heck of a week. Hang in there. As for really negative people, that is sooo hard to have to work with. My first reaction is always to say, "Get over it!" Then, the Christian in me comes out and I ask myself, "What is happening to him/her in their lives that is making them so miserable." Maybe if you could find those little things out you may find the empathy for them. On the other hand, there are some people on this earth that aren't happy ever and they want no one else to be happy around them. Love this post. 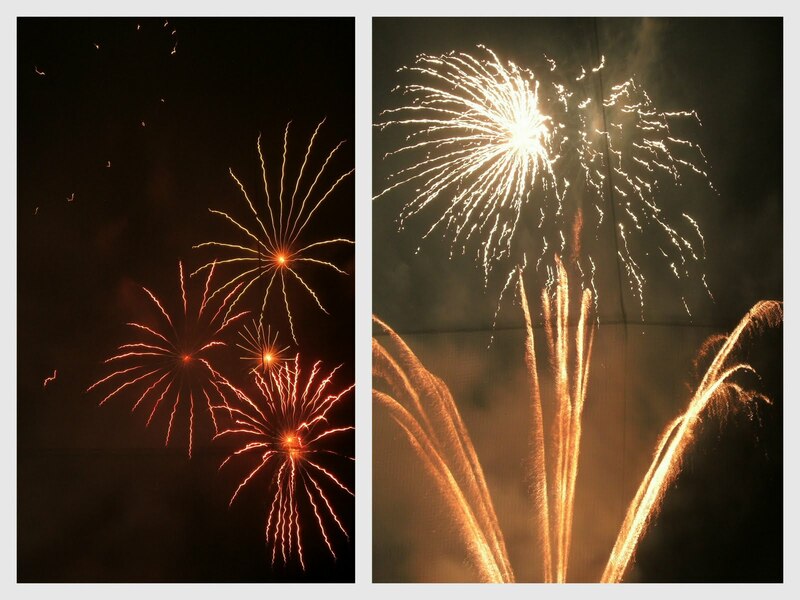 I loved the firework pictures. I have not tried the M & M pretzels yet....but want to. My inservices are next week. I am taking an INow class (our new STI program), a Mac book refresher course and a technology one. We are not having speakers per say....because of Proration. Whooo Hooo for that I guess. I hope this coming week (and of course the rest of the year) are great for you! And yep, those pretzel mm's are delish!!! sounds like a wild week. hope the next one is less hectic. Wow, what a week. Good luck with the new school year. I have to start thinking about going into my room soon. Your boy done good!! A Yankee Candle is just what the Dr. ordered to put some love into someone's life. Ohhhh, I've never had the pretzel M&M's - that' s just what I need, one more thing of chocolately goodness to fall in love with. LOL!! Good luck tomorrow with the first day of school. You'll find your groove and be back in step in no time...How do I deal with negative people? I avoid them as much as possible. I know I'm easily influenced by negativity so I try to surround myself with positive, laughing people as much as possible. Oh my goodness you had a busy week! What a sweet son for giving you that! I have been wanting to try those M&M's! I haven't found them yet! They sound so yummy!! I start inservice hell on Wednesday. Not looking forward to it.